4.7 (Based on 23 Reviews) 87% of reviewers recommended this product. The 20mm SWA is awesome. I'm fairly new at Astro observing. I've only been telescoping for about 3 years. But, I know a good product when I see one. Of all the eyepeices I have, the Agena is right at the top. I wear glasses and with the long eye relief it is a joy to use and quite affordable. Shipping was quicker than expected. Recommended. 5.0 A great wide field eyepiece for my long refractors. I have found this eyepiece to work very well in my long refractors. The image is good all the way to the very edge. Sharp in the center less so on the edge. Works well with F7.5 and F10 scopes. Review by miracle man of Spokane, WA. 70 degrees is nice. Any more field and you would have to press your eye against the eyecup. The extra field makes it much easier to find objects and keep them centered. This one is sharp out to the edge. Well made eyepiece with excellent coatings. Sharp to the edge in f/8 & f/7 refractors. Got this so I could do eyepiece projection prominence photography with my Ha solar telescope. 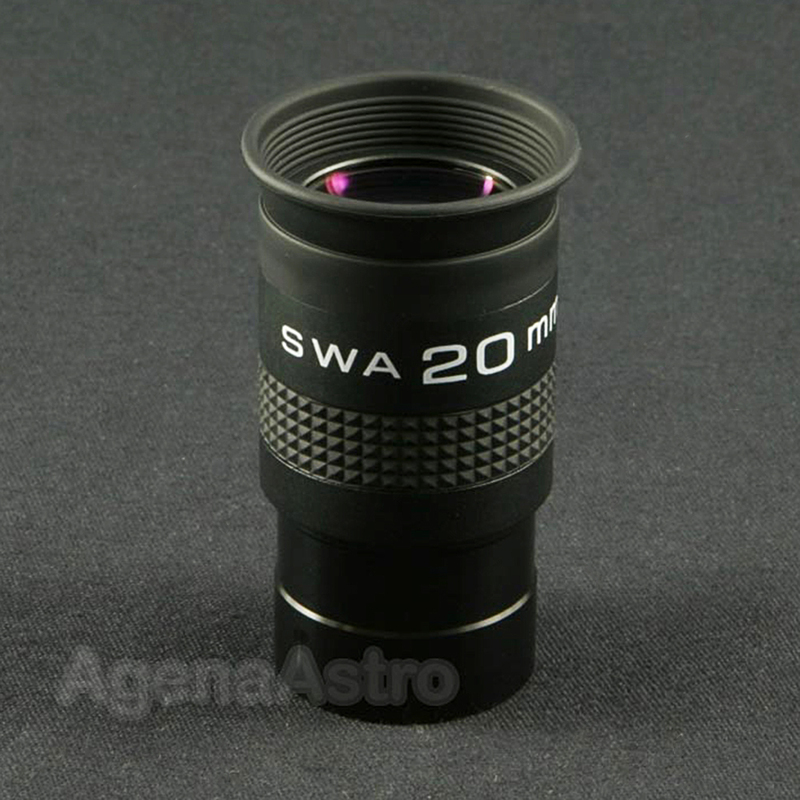 I also have the SWA 15mm but wanted the wider field of view this 20mm eyepiece provides. Review by ABHAT of Middletown MD. 3.0 Not as good as other agena wide angles. Lot of coma at the edges. Very small portion in the middle is good. Works well with slow scopes f/8 or higher. I would not use this EP for f/6 or f/5s. Review by Aaron the stargazer of Twin Falls, ID. I bought this recently from AgenaAstro. It arrived a few days after order. When I first got it, I thought it was hard to see the full field of view. However, after getting my eye placed just right, I now see that it is indeed 70 degrees or clearly larger than my 60 degree binoculars. I can see about 90% of the field of view with my glasses on, which eat up 18mm. Seeing the full field of view from different angles is much easier in my Plossl. However, even looking through the SWA with the wrong eye placement and seeing only part of the field of view, it is still much larger than that of the Plossl. Eye placement in my 60 degree binoculars is much easier, as is seeing the full field without glasses. My binocular edge can black out a bit when I try to look at it directly, but I don't feel as tempted to look there because I can see it more easily in my peripheral vision being closer to the center. With glasses, I see less than 50% of the field of view in my 60 degree binoculars. It takes some looking back and forth and finding the right eye placement to see that the 70 degree is larger than the 60 degree, but once found, the 70 degree clearly is better. I've looked through 82 degree eyepieces before, and felt them getting bigger as I got closer until I was not sure if I should get closer. I've also looked through 100 degree eyepieces. The eye relief on those is too short to see the full field of view. But you can see the edges just fine simply by moving to the side and looking at an angle. I can even do that a bit with the 70 if I get in the right location. I looked through a Panoptic 35mm and found it much more immersive than this 20mm SWA. As for sharpness, I have not yet done a star test. I put it in an f/5 refractor on a tripod, 80mm x 400mm, and looked at the moon and Saturn and some tree leaves. The moon looked plenty sharp in the center. When I moved it near the edge, it was much softer, and there was some lateral chromatic aberration. However, these were only noticeable when I looked at it directly. I could not tell with my peripheral vision. The edge sharpness is plenty good enough to find your way around the stars and not be distracted. At 20x, I could not tell that Saturn has rings in the center of the view, though I was not expecting to at 20x. My 25x70 binoculars just barely show ears. With other eyepieces in longer scopes, I've seen Saturn as a tiny ball in a tiny ring at 35x. Finally, the distant tree leaves. The leaves looked very good in the SWA. The eyepiece is small and light and sturdy. It looks good quality. I looked inside, and the field stop is as wide as the inside of the barrel. Basically, I see a big lens, not a field stop, same as my 32mm Plossl. The reflection control is excellent. I can see far less of my reflection in this eyepiece than in my coated binocular objectives. The inside is very black. For the price the quality is very good. Review by Paul of North Carolina. I am pleased with the quality of construction, coatings, and performance of this eyepiece. It is sharp to the edge in my f/9.3 and f/11.4 refractors. The image is great nearly to the edge in my f/6.6 Newtonian. Lightweight, easy eye placement, and good contrast make this an enjoyable eyepiece to use. With my 3x barlow it also becomes a 6.7mm SWA. Great price and service from Agena. Thanks again. Review by Jaws of Royersford, PA.
5.0 Good eyepiece at a good price! Exactly what I was looking for. A nice quality wide angle eyepiece that is easy to use, inexpensive, and easy to focus. Good budget conscious choice for SCTs, Maks and slow refractors. Decent eye relief. Nice coatings. Very lightweight. A lot for little money. Review by phliperfil of Cumberland Ontario Canada. Review by Mauricio MTYMAK of Monterrey, Mexico. Will never sell it again! Review by Chris M of Los Angeles. I'm a beginner and heard about Agena's EP's at Cloudy Nights. This wide angle piece is a great value. 5.0 Great quality at a good price. This is a great eyepiece. It's very solid construction, excellent light scatter control, a good wide field and good eye relief without any kidney beans or any other nasty effects. Only minor problem it has is when used in Newtonian fast (under f/6) scopes. Then you see a bit of coma on the edge of the FOV extending for 10%. It's not much and I find it acceptable, specially if you consider that to get read of this you need EPs that cost 5 to 10 times as much. It's very comfortable to use. It's one of those EPs that seam to "get out of the way" between you and the target you're observing. If you have an f/6+ scope you'll be 100% satisfied. With a f/6- they still perform great and are a great value for you money. edges out of focus in 4.5 reflector. I bought this eyepice for use in an 80 mm refractor and starblast 4.5 reflector. The eyepiece is well built and feels solid. Filters thread onto it very well. The eyepiece has great relief and huge field of view. Viewing through it causes no eyestrain at all. In the 80 mm refractor the images are crisp all the way to the edge. In the 4.5 reflector the images are out of focus at the edges. It still focuses crisply in the middle, you just loose a little on the edges( this is the only minimal drawback I found). Overall I love this eyepiece and would recommend it to a friend. Review by Starviewer of Missoula MT. I am using this eyepiece in a Nexstar 6'' scope, and it is one of my favorite oculars. I am an optician, and have been an amateur astronomer for a long time! This ocular is very sharp, showing 6 of Saturn's moons at about 75x. Review by rekterx of Alpine, TX. I use this in my Celestron Omni XLT 102 and it is a match made in heaven. I get a reasonably wide view in an 1.25 diagonal that is very clear to almost the edge of the field. I plan to get more of these. Great all round eyepiece. I bought this Agena 70* 20mm used but it was in new condition! The color corrective coatings are very good! The eye relief is great! Since I do a lot of imaging and viewing, parfocal is a must and this has that! So I can say by using this for the past 2 months, I am very pleased with the views! The Agena had truly blackened lens edges and very little stray light from the eyepiece barrel. The coatings were well applied, and the quality was excellent. It came with a bolt case and had a black, reversible barrel which comes in handy for binoviewer use in my Burgess binos. The Agenas do well for both low power viewing and high power lunar and planetary observing. There is some lateral color when you try to view something like Saturn near the edge of the field, but this is expected in a wide angle eyepiece...some sacrifices had to be made. However, as long as you can keep the object fairly centered in the field of view, there is no lateral color at all, and the views are excellent. There is some field curvature present, but in my F8 scope I did not find this annoying or even really noticeable at all. However, these eyepieces are not really for a fast scope, and in the ST80 which is an F5 scope, the stars turned into lines starting at about half-way out from center of the field of view. For a fast scope, stick with a plossl or some other eyepiece with a flat field. To sum up, these eyepieces are of excellent quality and provide wonderful views in medium to slow scopes. Highly Recommended!!! The tops lens cap won't fit inside the bolt case, but it's nice to have!! I bought this Agena 70* 20mm used but it was in new condition! The color corrective coatings are very good! The eye relief is great! Since I do a lot of imaging and viewing, parfocal is a must and this has that! So I can say by using this for the past 2 months, I am very pleased with the views! It comes with a nice clear bolt case which makes it very easy to see the size of the EP! The Agena had truly blackened lens edges and very little stray light from the eyepiece barrel. The coatings were well applied, and the quality was excellent. It came with a bolt case and had a black, reversible barrel which comes in handy for binoviewer use in my Burgess binos. To see all the things wrong with the William Optics SWAN, just see my review here on Astronomy Ratings and also on Cloudy Nights. The Agenas do well for both low power viewing and high power lunar and planetary observing. Unlike what was stated in another review here, there is some lateral color when you try to view something like Saturn near the edge of the field, but this is expected in a wide angle eyepiece...some sacrifices had to be made. However, as long as you can keep the object fairly centered in the field of view, there is no lateral color at all, and the views are excellent. There is some field curvature present, but in my F8 scope I did not find this annoying or even really noticeable at all. However, these eyepieces are not really for a fast scope, and in the ST80 which is an F5 scope, the stars turned into lines starting at about half-way out from center of the field of view. For a fast scope, stick with a plossl or some other eyepiece with a flat field.